There’s no such thing as a trip to Mackinac Island without a stop for fudge. I mean, seriously, there are more fudge shops on the Island than there are Starbucks in the hipster portion of any major American city. We spent the majority of our first day on the Island at the Grand Hotel. When it came time to head back down to Main Street to catch the ferry, we had some time to kill. We missed the 7:00 and had to wait for the 8:00. I didn’t know what the next day was going to be like, so I wanted to do a little shopping before heading back to Mackinaw City. The first stop I made was at a fudge shop. There are so many to choose from, so I chose the one that I haven’t been to before…either on or off the Island. Original Murdick’s Fudge has two sh0ps on Main Street right across the street from each other. I guess on busy days this is probably a smart idea, but it just seems weird even though most of the fudge shops do this. The shop was getting ready to close up for the night when I walked in, so there was no more fudge being made in the window. The lone employee was working with a couple of ladies who were tasting several different flavors while deciding what to buy. The quaint little shop looks like most fudge shops. There is a large display case with all of the different flavors on one side and there’s a big kitchen area on the other where, during the day, you can watch a candy maker making the delicious Mackinac Island fudge. Once the ladies in front of me were done, I stepped up to buy a few slices. There were several that I really wanted to buy, but I stuck to three. I got a slice of Vanilla Chocolate Chip, Double Chocolate Caramel Sea Salt, and Chocolate Peanut Butter. The three slices ran me just a hair under $20. I know that Mackinac Island Fudge is pretty widely available in Michigan, but there’s just something about a slice coming from the Island. It has been about five years since J and I were last there and we’ve had fudge since then…but it’s just not from the Island. I was really interested in the Vanilla Chocolate Chip, but I waited until I got home so I could share all of the slices. Due to a family emergency, I ended up at my parents house after leaving Northern Michigan, so I got to share with more people than I had originally intended. I still got quite a bit of the Vanilla Chocolate Chip and it was magnificent. I bought the slice of Double Chocolate Caramel Sea Salt for J. Some of her favorite chocolates are sea salt caramels and I knew she would love this slice. The Chocolate Peanut Butter is always a safe bet because who doesn’t love chocolate and peanut butter?! 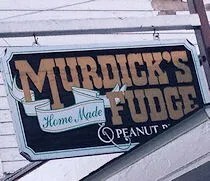 Original Murdick’s Fudge was exactly what I was hoping for the minute I stepped off the ferry at Mackinac Island. It was so hard to hang on to it for three days before unwrapping the slices, but it’s one of those things that are worth the wait. 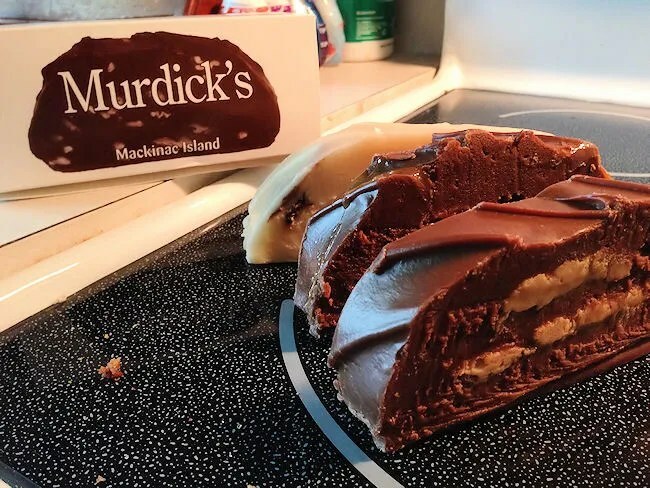 If you had actually researched the history of Murdick’s Fudge, you would have found that the actual Murdick family (who have been in the business of making fudge for over 128 years, operate a fudge store in Mackinaw City. 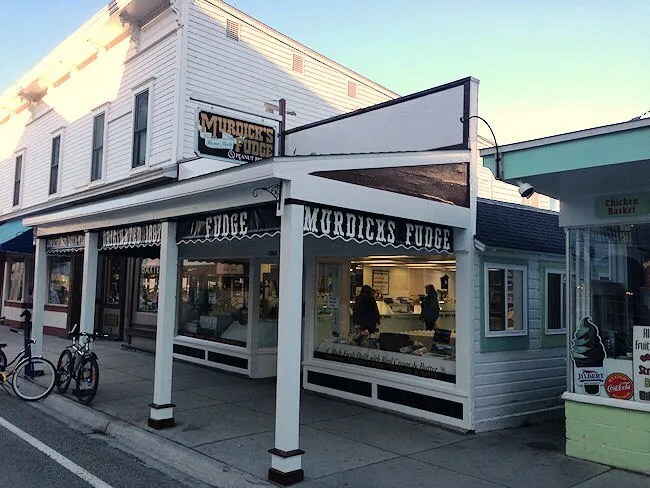 The person who bought the original Murdicks Fudge store on Mackinac Island is not a candy maker, but a very good marketeer. He has duped many people into thinking that he has good fudge by putting it in nice packaging and displaying pictures of the Murdick family. He also associates himself every chance he gets to the Murdicks. There are NO Murdicks associated with any of his stores.